The footwear and apparel maker will face tougher competition and weaker profitability over the next few quarters. Under Armour (NYSE:UAA) (NYSE:UA) was one of the hottest growth stocks in retail over the past few years, but it seemed to peak in the low $50s in late 2015. The stock subsequently tumbled to the low $30s on concerns that its high-growth days were ending. Let's take a look at five reasons why that bearish outlook might be true. Under Armour's revenue rose 22% annually last quarter, representing its slowest growth rate in six years. Analysts currently expect UA's revenue to rise 24% this year, compared to 29% growth in 2015 and 32% growth in 2014. Those numbers aren't bad, but they indicate that UA's growth could peak long before it becomes a true rival to Nike (NYSE:NKE), which generated eight times as much revenue as UA last year. UA's apparel revenue rose 18% annually to $1.02 billion last quarter, and footwear revenue rose 42% to $279 million on the strength of its Curry, Slingform, and Bandit 2 shoes. But UA's growing dependence on athletic footwear is troubling, since it's a heavily commoditized, low-margin market dominated by giants like Nike and Adidas. Fickle tastes, as seen in the public's poor reception of the Curry 3 shoes, can also prevent UA from effectively competing against Nike's best-selling LeBron James and Kevin Durant brands. UA is also still using markdowns to sell shoes which would have normally be sold at Sports Authority, which went bankrupt last year. 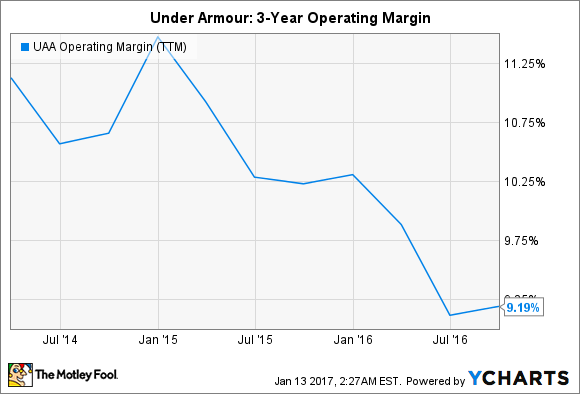 UA's growing dependence on low-margin footwear -- coupled with the higher costs of securing big sponsorship deals -- has taken a toll on its operating margins over the past three years, as seen in the following chart. To make matters worse, the Trump Administration's opposition to the Trans-Pacific Partnership and potential pressure to move jobs back to the U.S. (most of UA's products are manufactured overseas) could affect UA's operating costs over the next few years. Analysts expect UA's earnings to rise 13% this year, compared to 10% growth in 2015 and 26% growth in 2014. That bottom line growth is decent, but it doesn't justify the stock's trailing P/E of 60 and its forward P/E of 39. By comparison, Nike is expected to grow earnings by 8% this year, but trades at 23 times trailing earnings and 20 times forward earnings. This makes Nike -- which also pays a dividend that UA lacks -- a safer play at current prices. Faced with a gradual slowdown in its core businesses, Under Armour started expanding into adjacent markets like fitness apps, wearables, and connected devices. Over the past two years, it acquired popular apps like MyFitnessPal to expand its health-tracking ecosystem. Last January, it partnered with HTC to launch HealthBox, a $400 bundle which includes a fitness tracker, heart-rate strap, and a wireless scale. But the bundle was poorly received, with many reviewers complaining about its high price, inaccurate readings, and questionable design choices. Yet Under Armour didn't give up -- it recently unveiled a set of connected pajamas for monitoring sleep patterns and connected shoes for monitoring workouts. Under Armour bulls believe that these new products could diversify the company's top line away from apparel and footwear, but its "connected fitness" business generated just over 1% of its total revenues last quarter. If UA's core businesses were still headed for higher growth, it wouldn't be hyping these niche products. Another issue for Under Armour is its growing dependence on overseas markets for growth. Last quarter, its North American revenue rose 16% annually and accounted for 83% of its top line. But its International revenue surged 74% and accounted for 15% of its sales. Robust overseas growth is certainly a tailwind for UA, but it's clearly becoming another U.S. retailer that's running out of room to grow domestically. This could become a problem if the U.S. dollar strengthens over the next few years and gobbles up its overseas profits. There are still plenty of UA bulls who believe that the company will become the next Nike. But if you cut through CEO Kevin Plank's jargon-filled talk of cutting-edge fabrics and wearable technologies, UA is really just another apparel and footwear maker -- and times are tough in both markets. Therefore, investors should probably wait for UA's valuations to cool down a bit before starting new positions.